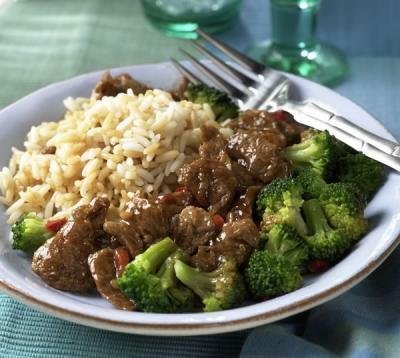 A delicious slow cooker recipe with Asian flair, this Beef and Broccoli dish is a fantastic meal idea and much lower in calories than the restaurant version. In 3 1/2 to 4-quart slow cooker, combine oil, beef, mushrooms, onion, broth, garlic, chili paste, soy sauce, pepper, and ginger; mix well. Cover; cook on low setting for 6-8 hours. About 35 minutes before serving, cook rice in water as directed on package. Meanwhile, in small bowl, combine 2 tablespoons water and cornstarch; blend well. Add broccoli into beef mixture, then stir in the cornstarch. Cover; cook on low setting for an additional 30 minutes or until broccoli is crisp-tender. Serve over rice.